Mr. Lees’ Carnegie Hall solo debut with the Cincinnati Symphony in 1999 was received with critical acclaim. 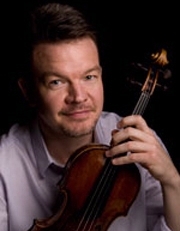 As described by Strings Magazine, his performance of Strauss’ Ein Heldenleben: “the display of egotisim is almost redeemed by the soaring melodies and the famous bravura violin solo, played with spectacular virtuosity by concertmaster Timothy Lees.” From Bach to Bartók, Mr. Lees’ flexibility and command of the solo violin repertoire is evident through his numerous solo appearances with the Cincinnati Symphony as well as on many other stages throughout North America. Upcoming highlights include appearances with the Cincinnati Symphony Orchestra where he will be the featured soloist performing the Barber Violin Concerto in February of 2016. As a recitalist, he has been featured in solo recitals in Cincinnati, Philadephia, San Diego and at Sarasota, Spoleto, Sebago-Long Lake and Mainly Mozart Festivals, among others. An avid chamber musician, Mr. Lees is highly sought after, frequently collaborating with the world’s most prominent artists including Jaime Laredo, Joseph Silverstein, Yefim Bronfman, Ida Kavafian, Peter Wiley, among others. Additionally, he has appeared in performances as guest artist with St. Lawrence and Apollo String Quartets. Mr. Lees is featured regularly in chamber music on established series including the Linton Music Series, CCM Faculty Artist Series, Oberlin Conservatory Series, Concert Nova, as well as appearances on Aspen Music Festival Faculty Artists Series and Spoleto Festival Series. His performances have been broadcast on NPR Performance Today, WGUC (Cincinnati), Aspen Public Radio, Maine Public Radio, and Florida Public Radio. Recent recordings include the soon to be released Bruch Octet, a collaboration featuring Mr. Lees with members of the Jupiter Quartet and faculty members from the Oberlin Conservatory of Music. A native of Philadelphia, Mr. Lees received the coveted Performer’s Certificate from the Eastman School of Music where he studied with Charles Castleman. Prior to his arrival in Cincinnati, Mr. Lees established himself as a distinguished leader serving as Concertmaster of the internationally renowned Spoleto Festival, the New Jersey, and the Charleston (SC) Symphony Orchestras. The expertise he has cultivated in his own command of both solo and orchestral literature is shared, not only by his recent addition to violin faculty of CCM, but also through master classes presented at Universities including CCM, Indiana University, University of Kentucky, Northern Kentucky University, Ohio University, Biola University, and others.